How? Sign up to Bowerbird, as I have done, and join Australia’s on line biodiversity network. Created by Australia’s foremost scientists, this easy to use site is one of the most exciting, crowd-sourced, database/ networks on Earth. Anyone can load their photos of native plants and animals on Bowerbird and ask for them to be identified by experts. Please make sure your pictures are in focus. It helps to take shots from different angles, sometimes the most peculiar aspects are important, like looking down on to insect wing cases. Sap sucking bugs can be difficult to identify. Assassin bug larvae get bigger each time they moult, plus their colours and patterns may also change. Different instars may look like different species, not differences between moults. Record on Bowerbird where you found your specimen, because your find might be a new record. That’s exactly what happened to me. My find, and my photo, have contributed to Australia’s national biodiversity database: The Atlas of Living Australia. “I’m loving watching your BowerBird entries and seeing other people interacting with them. I was not quite sure if you realised, but your information is contributing to our knowledge of the Australian biota. Take your recent “Unknown Cranefly” post. Once it was identified as Nephrotoma australasiae (a rare species) it got uploaded into Australia’s National data aggregator – the Atlas of Living Australia. Your record is one of only five records for this species. And one of only three images for this species. Importantly, YOUR image has been chosen as the representative image for this species on ALA and you have been duly credited with the photograph”. Back in 2003, I converted a barren plot into my sustainable food garden. Starting as a house in the middle of a weedy lawn surrounded by fencing, I decided to keep a checklist – a written and a photographic record – of every animals that either visits or calls my organic garden home. Ten years on, and I’ve recorded almost 420 species of animal, both vertebrates and invertebrates, and fungi. As the garden matured, so too has its biodiversity. By the fifth year, pest problems started easing. My continued success at food growing, through drought and floods, has also improved partly because of beneficial animals and the ecological services they provide. For example, low numbers of honeybees could mean poor crop pollination. However, my organic food garden and its non-hybrid crops have encouraged fourteen species of native bee to forage pollen and nectar from flowers. In return, these bees help fill my ‘pollination gap’. My crops are great. This year I discovered what seems to be an unknown species of parasitoid Leucospis wasp. This busy little insect parasitises the parasitoid wasps that parasitise my caterpillar pests. It’s an interesting concept, and it’s an indicator that my food garden is developing a mature ecology. I created my own project – ‘Bellis’ – in Bowerbird. It’s named after my home and garden. Over the coming months I hope to load images of each species that calls my 813 square metres of organic Australia home. The most recent discovery is that Species 419, Poecilometis armatus, a predatory bug that kills caterpillars, is a new location record. Ken Walker says “Jerry, your Brisbane record now extends the known distribution of this species several hundred kilometres south of the previously known southern limits”. If you have a garden, work in a community garden, or help keep a school food garden going, or just like bushwalking, then you could contribute to Bowerbird. Like my ‘Bellis’ project, you might even want to create your own garden biodiversity project. You never know, you may find yourself discovering a new species – or a new record – for our Atlas of Living Australia. Thanks to Bowerbird, it’s never been easier to leave your mark on the biodiversity map of Australia! 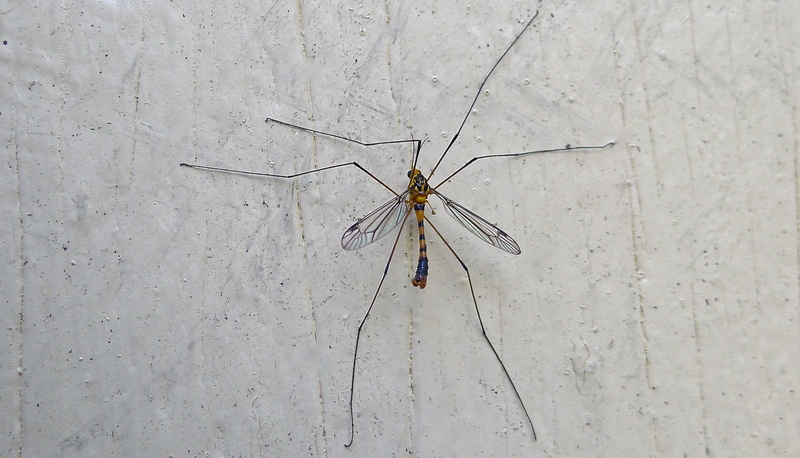 Pictured: the rare crane fly, Nephrotoma australasiae. Wow Jerry that’s amazing. I try to keep a record of the birds that visit but you’ve inspired me to keep an eye on the insects too. Congratulations on your contributions so far to our official records.